On February 7, joined by a panel of ten scholars and authors, Gover will deliver opening remarks for a discussion on the history and ongoing use in sports today of Indian mascots. Though many have been retired, including Oklahoma’s Little Red in 1972, notable examples—baseball’s Cleveland Indians and Atlanta Braves, and football’s Washington Redskins—continue, perhaps not as mascots, but in naming conventions and the use of Indian motifs in logos. 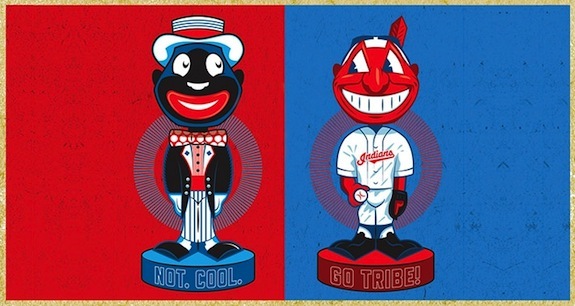 By Annys ShinThe symposium on “Racist Stereotypes and Cultural Appropriation in American Sports” was a day-long assault on the use of Native Americans as sports mascots. It was a thorough prosecution, delivered by a dozen or so mostly academic speakers before an audience of more than 300 people. The speakers took issue with the standard defense offered by past Redskins owners that the name is a way of honoring Native Americans. “Honors like that we don’t need,” said Robert Holden, deputy director of the National Congress of American Indians. The name was intended to honor one man, former head coach William “Lone Star” Dietz, said Linda Waggoner, a lecturer at Sonoma State University in California. As the story goes, in 1933, co-owner George Preston Marshall renamed the then-Boston Braves the Redskins after Dietz, who adopted the identity of a Lakota man as part of his persona. The Redskins name followed the team to Washington. Waggoner said Dietz may not have been Sioux at all but initially passed himself off as so to avoid military service. By Patrick B. PextonThe Post recently published a spate of columns, by different writers, calling for the local National Football League team’s nickname to be changed to avoid its racist overtones. You know, the red and gold team led by Robert Griffin III. Meanwhile, on Jan. 28 The Post pulled from publication a short high school sports story about the girls swim team at Holton-Arms School in Bethesda, the Panthers. It was held because the photo that went with the story showed the girls, who dress in a different theme each meet to encourage team spirit, wearing face paint and feathers—seemingly Native American warrior garb.And:I talked to Native American groups and individuals this week, too, about the football team’s name, and about the swimmers in their garb. I’m not sure words can properly convey the depth of feeling I heard from them. Wearing face paint and feathers, many Native Americans feel, is a taking of their cultural and religious traditions. The paint and feathers have distinct meanings for each tribe and nation, and they often are worn only because an individual has earned them through tests, deeds and ceremonies of which white culture has little knowledge or appreciation. The best analogy I could come up with is the way we treat U.S. military uniforms and insignia. It is against federal law for a civilian to wear the uniform of a U.S. soldier, sailor, airman or Marine for personal gain. Similarly, within the military, if you wear a medal or insignia that you didn’t earn, it is a crime under military law.And:As for RGIII and his teammates, Harjo and every other Native American I spoke to see the team name as racist. It hearkens to the early European settling of this country, when French and British authorities put bounties on the heads, or skins, of Native American men, women and children. “Every major national Native American organization has declared that the name of the pro football team in our nation’s capital is the most offensive thing native peoples can be called in the English language and has called for it to be changed,” she said. If you know this background, it’s risible to hear NFL Commissioner Roger Goodell say, “I think Dan Snyder and the organization have made it very clear that they are proud of that name and that heritage, and I think the fans are, too.” There is nothing to be proud of in this “heritage,” unless your tastes tend toward the antebellum South. In a league that’s 70 percent African-American yet couldn’t seem to find any coaches or executives of color to hire this off-season, the Redskins are also a reminder, as William Faulkner wrote, that “The past is never dead. It’s not even past.”Comment: Patrick Paxton is the Washington Post's ombudsman. His commentary is another sign that people are starting to take this issue seriously. Note that I compared wearing headdresses to medals in Hipster Medals Instead of Headdresses. Glad to see someone else recognized the validity of the comparison. For more on the Washington Redskins, see Rob Quoted on Washington Redskins, Indians Are "Whiners," Not Warriors? and "Redskins" Approaching a Tipping Point? “If you ask me, it is offensive,” Begay said midway through the segment, when asked about the Redskins name. “And I think it’s just a very clear example of institutionalized degradation of an ethnic minority, that being the Native American people. To classify it as simply a matter of political correctness only seeks to trivialize it a little bit, to an extent that it undermines the very human foundation of the people itself. I mean, if you look further and deeper into the issue, it’s about the culture, it’s about the identity, it’s about the history of our people. And that in and of itself is something that I think needs to be looked at further.